Many ISP's limit the size of files that can be attached to an email, often as little as 10 or 20 MB's is the maximum size. How can send a big file to your family or friends such as a video that size is over 20MB? I think you can use some file host sites, or use Mailbigfile to do it. It is very simple to use, and also free without register. 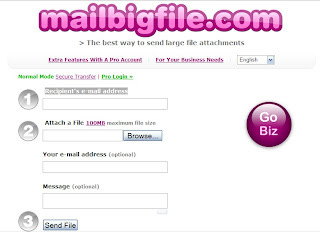 You just fill recipient's e-mail address, upload your file, then click send it, Recipient will get a mail with a link, just click link for download file. Mailbigfile allows send file up to 100MB, and stay in its server 3 days, allows download 3 times. If you ask me about what difference between free host and Mailbigfile, I just say I do not know.